When I started to put this concert together, I knew early on that I wanted a piece by Charlie Sdraulig. I’ve written about his music, briefly, once before on this blog, and the sense of theatre (that isn’t really theatre, it’s just people playing their instruments), the aura of risk and failure, the downright peculiarity of what he does, was something I wanted to get on stage. But Charlie didn’t actually have a piece yet that fitted the line-up that I was starting to settle on. So he very kindly agreed to produce a new version of close, his trio for shakuhachi, voice and bowed string, that replaces the shakuhachi with a clarinet. And I’m thrilled that we’re getting the first performance of that version. In the interview below, Charlie talks a little about risk and failure, as well as the relationship of his very quiet music to its surrounding environment. In the performance instructions for the vocal miniature, few, there is a line that I don’t think I’ve ever seen on a score before: ‘If the environment changes in a way that makes it impossible to finish the score, abandon the performance.’ Composing in the possibility of abandoning a performance seems such a peculiar idea, but it captures something of the values at work here. I never really considered composing to be a career choice, let alone an anachronistic one. It always was and remains a compulsion. As soon as I began to take piano lessons, I began composing and haven’t stopped since! Why do I continue to compose? I am interested in writing music that allows a particular type of human interaction to take place in sound. I aim to create a sound world that is constantly redefining itself, negotiated and under discussion, which potentially allows the fragility and ambiguity of the act of perception to become audible. I hope to create a listening environment of heightened intensity that explores predominately soft sounds in subtly differentiated detail, a situation that may in turn potentially empower a listener to approach their sonic environments in an aware and sensitive way. TR-J: What role does silence play in your music? Although my music often takes place at the threshold of audibility, very rarely do I actually compose silences. There is always the potential for sound to occur to a greater or lesser degree. For example, if a performer holds their bow one to two millimetres above a string, their trembling musculature will cause occasional non-intentional contact to be made. However, often no contact takes place at all, leaving only a physical gesture and silence. Manipulating the various parameters involved, such as bow height or speed, will change the risk of sound being produced. As a result, silence often arises when the intention to produce a sound fails and so momentary silences permeate my work. I propose that these fluctuating ratios of sound to silence allow a particular expression of humanity to be communicated by approaching the space between performer and instrument with the utmost care and sensitivity: an acceptance and celebration of human fallibility and individuality. The more I explore extremely soft sounds, the more I am acutely aware of the ever present ambient sounds in any given environment. Occasionally, my music may have the propensity to act within its own bubble, oblivious to the sonic environment that envelopes it. Composing an extended silence, as an absence in the intention to create sound, could highlight this environment. I am still working out exactly what my relationship with ambient sounds could be and how I could enter in to dialogue with them. Potentially my music could open itself up to interacting with its sonic environment via cues. That said I have also experienced occasions when pieces of extremely quiet music drew me in to the extent that I selectively prioritised what I perceived to be important sounds in the performance space, so that I was largely unaware of sounds extraneous to what I perceived to be the musical text. In any case, the distinction between sound and silence can be somewhat difficult to determine when listening to sounds at the threshold of audibility. The perceptual ambiguity of these sounds allows each listener to actively construct this distinction, amongst other things, or not. TR-J: A lot of compositional work concerns ways of proceeding, of extending an idea in time. What sort of decisions are you dealing with as you compose? The majority of my recent work has primarily explored interaction, such as the interaction between a performer and their instrument, as well as the interaction between one performer and another. I have also been particularly interested in investigating and extending the role of physicality and perception in these interactions. Consequently, many of my compositional decisions relate to specifying the exact nature of the interactions in a given piece. I always work closely with a performer to find ways of making sounds that allow that particular expression of humanity, which I described earlier, to emerge via an often tenuous interaction between a performer and their instrument. I define physical boundaries that explore the relatively greater or lesser likelihood of a sound actually being produced. Ideally, subtle parametric changes within these boundaries would then create a vast number of micro-variations in that sound. If I am writing for a small ensemble, the following questions arise: how can I organise sounds created by the unpredictable interaction between a performer and their instrument? How can metre delineate temporal relationships in a context where sounds may be imperceptible or simply not occur at all? Furthermore, beyond purely practical considerations, what do I want the nature of performer to performer interaction to be in my music? Working as an accompanist, I would occasionally reach an under-rehearsed ritardando, the predictability of the prevailing metre would fall away and a highly contingent form of moment to moment interdependent interaction would occur due to not being able to exactly predict when the other player would act. Essentially, we would aurally cue each other. I found these to be extremely satisfying experiences as a player and, when I perceived them in other people’s performances, as a listener as well. After encountering and experiencing the work of Christian Wolff as well as playing as an improviser, I became more and more interested in the performative alertness and flexibility engendered by sonic contingency. As a result, I now tend to use various types of cuing that allow temporal and parametric relationships between the parts to be flexibly shaped in real time by each performer’s perception, their listening. Many of my compositional decisions in this domain relate to finding means of cuing between performers that are as tenuous and unstable as the interaction I set up between a performer and their instrument. This could take the shape of something as simple as a question such as ‘is the timbre of the sound of the other player changing at a faster rate than mine?’ and altering different parameters depending on a ‘yes’ or ‘no’ response. In my recent work, I tend to treat time as a context where these interactions mediated by perception (cues) occur within a physical frame (breath or bow lengths). At the moment, I very rarely think about pitch with reference to equal temperament. I tend not to specify exact pitches but employ a tablature of some sort. In fact, I usually think about pitch as being relatively high or low, dependent on another element. My pitches generally serve an interactive, physical or perceptual function. For example, at times I use the pitch direction of glissandi as the basis of a cuing system or explore a variety of high breathy whistles due to their inherent sonic and physical instability. So a middle C could potentially occur in the context of a glissando that has a function in a particular cuing system or it might not. Ultimately, I don’t think it would matter very much. Personally, I would rather start by attempting to create an interactive framework that could lead to an environment where active and sensitive listening is prioritised. Everything else would flow from there. Here are the previous posts on Gregory Emfietzis and Ben Isaacs. 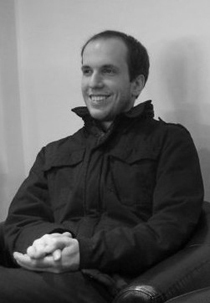 Ben Isaacs studied composition at Huddersfield with Aaron Cassidy and Bryn Harrison. His current work includes a new piece for flautist Richard Craig and a three-glockenspiel piece for the line upon line ensemble. As Ben says below, silence doesn’t actually feature in his music much at all – but allone gets the nod for this concert because it sits right on the edge of inaudibility and, what’s more, crams that tiny band with a whole lot of activity. It’s a sort of nearly-imperceptible virtuosity that might carry Beckett-like connotations of futility and waste if it weren’t so damned beautiful in its own right. 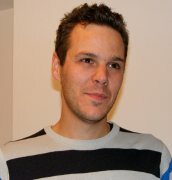 Ben Isaacs: One of the things that most appeals to me about composing (in the sense of producing musical notation for musicians to interpret) is the particular way it combines individual creation (each score I produce is very much ‘mine’ and no-one else’s) and collaboration (I am completely reliant on others in order to actually hear the music). To me this specific balance is significantly (albeit not entirely) distinct from other forms of music making, and I imagine that this distinction is part of the reason it endures as an art form, and won’t seem too anachronistic any time soon (even if the question does occasionally get asked!). BI: Almost no role at all! Or at least it’s not really an aspect I explicitly consider whilst composing. However, over the last five years I have focused on writing extremely quiet and fragile music, so for an audience it does quite possibly draw attention to the act of listening in a similar way to music which does deal with silence (however the word is understood) more overtly. For me, this is a wholly welcome outcome of the work as I’m very much attracted to the sense of ‘live-ness’ musical performance can engender, though I tend to avoid pauses of any substantial length in order to maintain a continual fragility of sound. 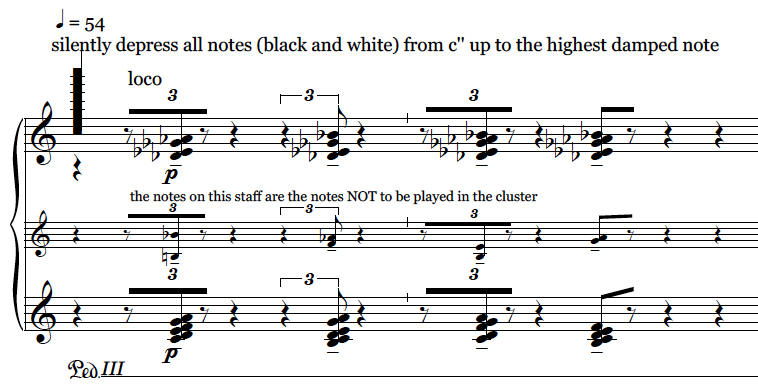 I often write in my performance instructions that the sound should be ‘barely there’, with the implication that it is ‘there’ nonetheless. BI: Aside from their volume, my pieces typically work within a number of other constraints. Most commonly, this involves severely restricting both the range of pitches used, and the physical gestures with which the performers produce sound. Once these have been established, it becomes a question of emphasising the volatility inherent in the combining of the constraints (for example, various trills and tremolos swelling from niente to pppp and back again using only the top seven notes of the piano). Often these gestures will be repeated, with their various constraints ensuring different results each time, or the range of pitches will gradually expand and contract, affecting the variety of available gestures. In any case, the focus is on the minute. I aim to create dynamic and intricate music that presents a constantly shifting surface whilst remaining extremely constricted. I have also begun to work with longer durations. 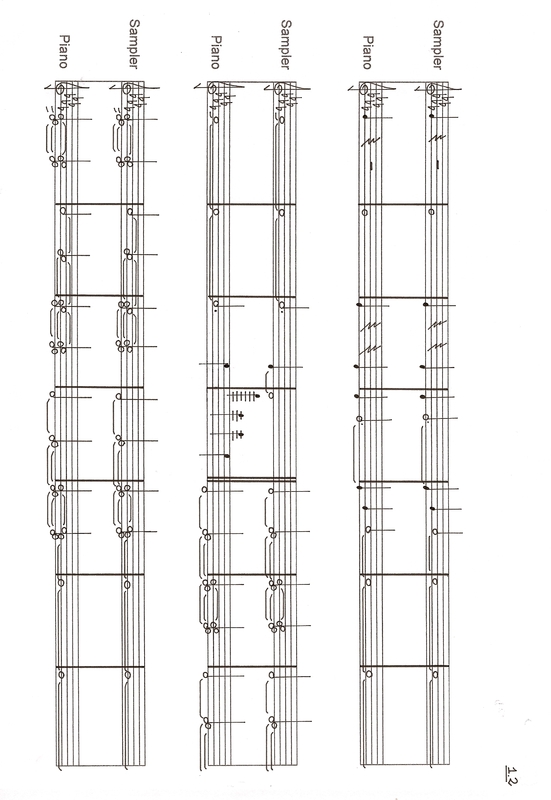 In February Kate Ledger performed an hour-long version of my piano piece too expanding and I recently finished a glockenspiel trio for line upon line percussion that can last up to two hours. The combination of concert-length durations and extremely constricted music is one I’m very intrigued by. BI: Firstly I imagine I’d transpose it up a couple of octaves, or maybe even three or four. I’m drawn to both the instability inherent in playing winds and strings at low volumes in the upper register, and the thinness of sound and short decay at the top end of a piano or pitched percussion instrument. 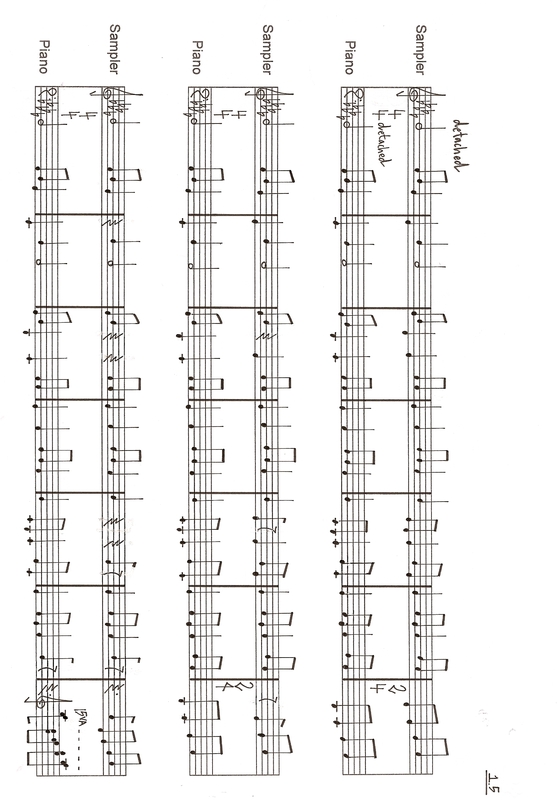 I’m also keen on homogenous ensembles so perhaps I’d have a string trio drawing their bows too slowly to produce clear pitches, playing very small glissandi towards the top of their highest string, and with an occasional trill in there too. Probably there’d be a number of repeating patterns, with the fragility of the bow strokes cracking into different rhythms with each repetition. I wouldn’t need to add much to that. Here is the previous post on Gregory Emfietzis; coming up: Charlie Sdraulig. 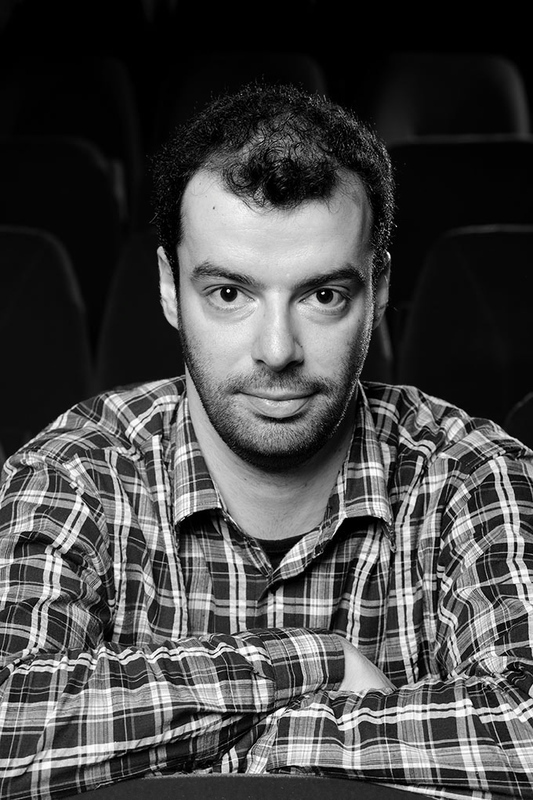 Matthew Shlomowitz is a composer who defies easy categorisation. 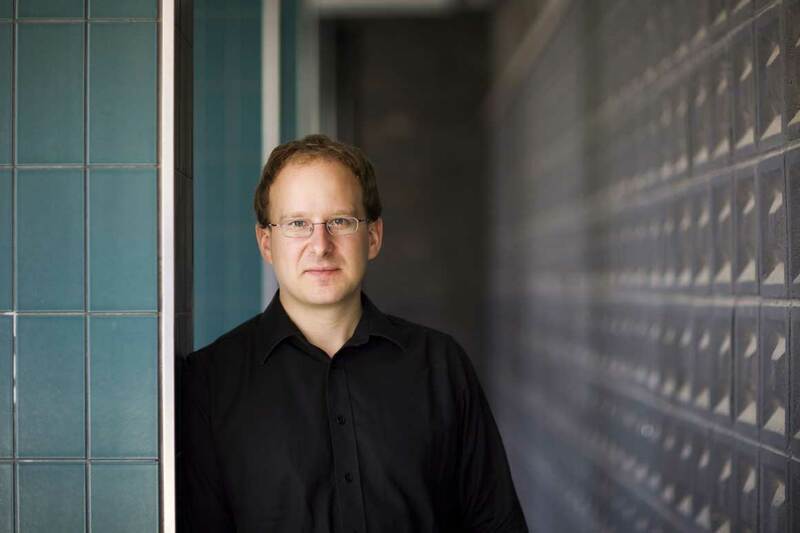 An Australian who has lived in London for eight years, he has studied with both Ferneyhough and Finnissy. Yet on a first listen his music seems to owe nothing to either of them. For about five years now, Shlomowitz’s music has become increasingly beat-based, rhythmically simple, with everything becoming locked to a grid of steady pulses. None of the rhythmic intricacies of Ferneyhough or Finnissy here. But this simplicity doesn’t sound naive. 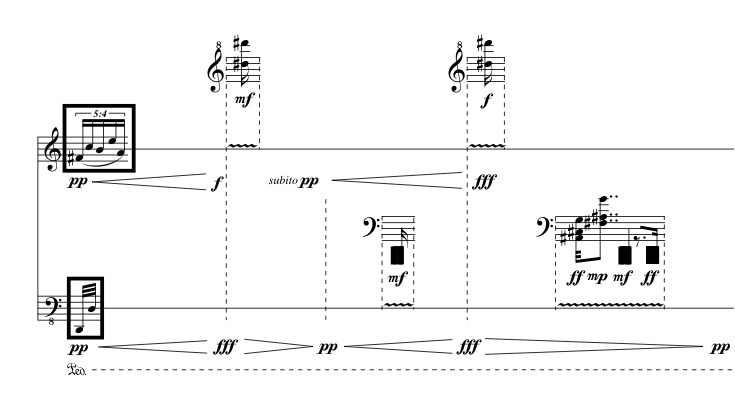 Without wishing to push this too far (because there are intricacies of rhythm here that arise as by-products of the score once it reaches performance), Shlomowitz’s music has a rhythmic whiteness that is at a level very rarely heard in any music. Such consistency, such evenness, is disconcerting, even shocking. E is a non-conducting gesture of the conductor’s choice. The performers are Gijs Kramers and the Ricciotti Ensemble. In a way, the grid is like the white walls of a gallery. It’s what happens within the spaces that is interesting. 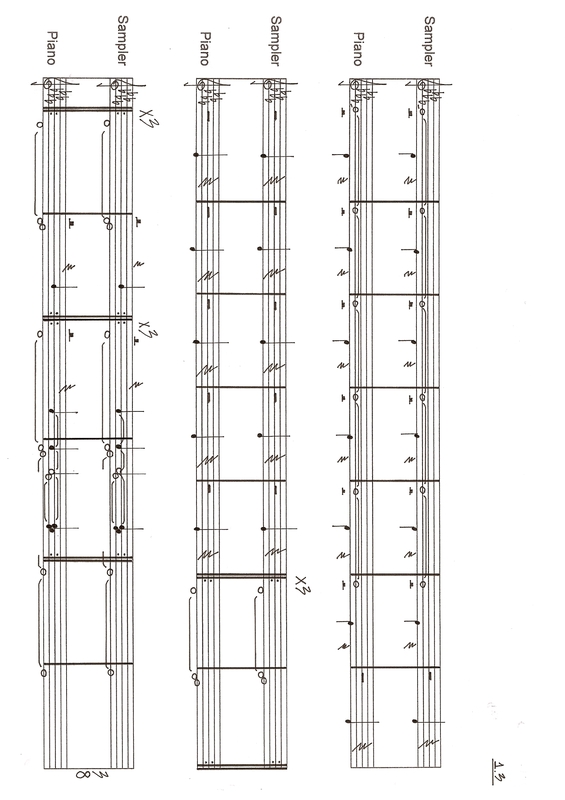 Shlomowitz, like Finnissy and like many other composers of his generation, is fascinated by the nature of material: the connotations, both musical and emotional, that a short burst of notes or even a single sound can hold, and the limits of those connotations when material is stretched, reworked or placed in unfamiliar situations. Although his earlier work (some of which is available to listen to on his website) uses more abstract material, Shlomowitz has recently been drawn to material drawn from the everyday – popular music and concrete sounds. 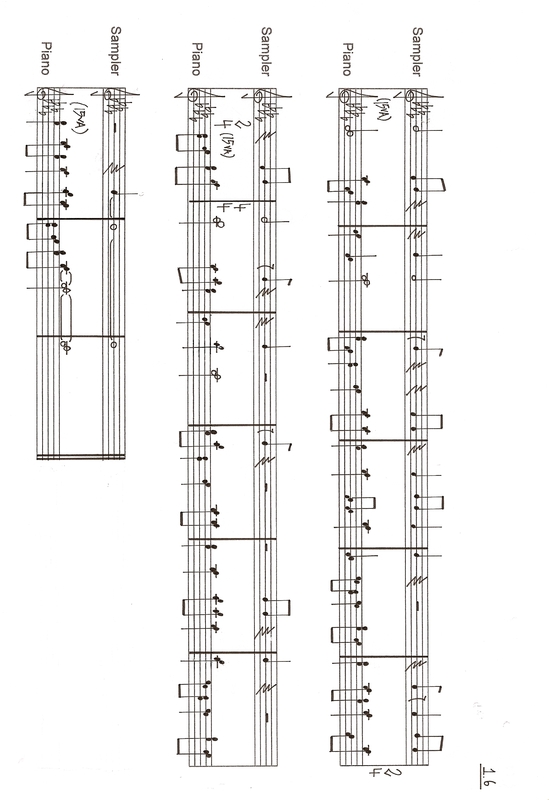 Because of the latter, samplers have come to play an increasing role in his music, and a good example will be heard in Monday’s Kings Place concert, at which a major new work for piano and sampler, Popular Contexts, will receive its premiere. As will be seen below, Shlomowitz isn’t so much interested in reworking his material into unrecognisable new forms, but is more interested in the aesthetic frictions created by juxtaposition, translation and recontextualisation. The score for the first of the six Popular Contexts pieces, Free Sound, is available below: the key, I think, is the defamiliarising juxtaposition of quite aggressively ‘real’ sounds – including station announcements and machine-gun fire – with a concert pianist. The effect is initially comic, but it is carried through with such deliberation and solemnity (a product of that rhythmic evenness) that one can’t help but want to hear through to the deeper underlying story of the piece. title page, page 1, page 2, page 3, page 4, page 5, page 6. NB: Unlike previous interviews in the 10 for ’10 series, this one was conducted live, over Skype, rather than by email. We began by talking about the use of samplers in Popular Contexts. Tim Rutherford-Johnson: Once you’ve collected all your sampled, concrete material together, how do you organise it? 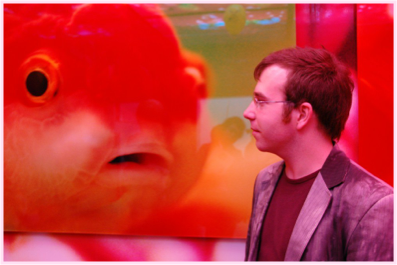 Matthew Shlomowitz: The first thing to say is I should come clean and say that I’m not making field recordings, which composers with more integrity than me might [laughs], I’m just ripping these samples off the internet. 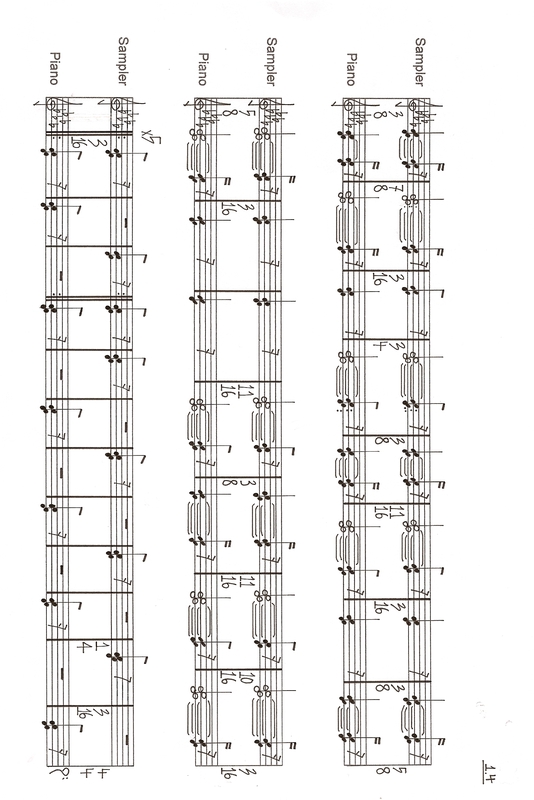 And the first in the Popular Contexts series of six pieces is called Free Sound, which has a double meaning. The first is really an acknowledgement of www.freesound.org, a very nice website for ripping samples. And the other confession is that I use Garageband, just a stock standard programme on Apple Macs, so I export all the samples into there and just start mucking around with them really. TR-J: And do you have a plan for the form or do you intuit it as you go along? MS: A mixture. What I’ve found recently is that I’ve been mucking around and just generating lots of stuff that I like, and then kind of listening to it at some moment when I’ve got some distance from it, and then trying to think about a form or think about what I’m doing with it. I notice that when I work on Garageband one big problem is that you keep on trying to make it fun and exciting to listen to so it frolicks along happily, but then sometimes I think there’s no critical distance at all from the material, it’s just trying to be exciting. So I try to step back and have a listen and try to reformulate what I think it is. TR-J: And is working in something like Garageband and pulling samples off the internet rather than field recording, is that just a question of practicality, or is there an aesthetic dimension to that, working with quite off-the-peg sources and technology? MS: Yeah, on freesound you can find really beautifully recorded things and really badly recorded things, and I like both at different moments. I like making shifts between them even, so you make a really trashy moment in a piece that previously had quite beautifully recorded sounds of things. So there’s not one aesthetic towards these sounds. I guess the reason it’s really nice, rather than recording sounds myself is that I often work with topics, so one of the Popular Contexts pieces is really all about telephone sounds – in the broadest sense, not just the sound of telephones, but everything around telephones, even cold-calling when people try to sell you things. Everything to do with phones, and then it’s really easy to find heaps of stuff. TR-J: Is that sort of topic-based thinking going on in a piece like Northern Cities? MS: Well in all of the Letter Pieces the content is not defined, so it’s a bit different. The performers create the material, which is usually a mixture of physical actions and sound events. 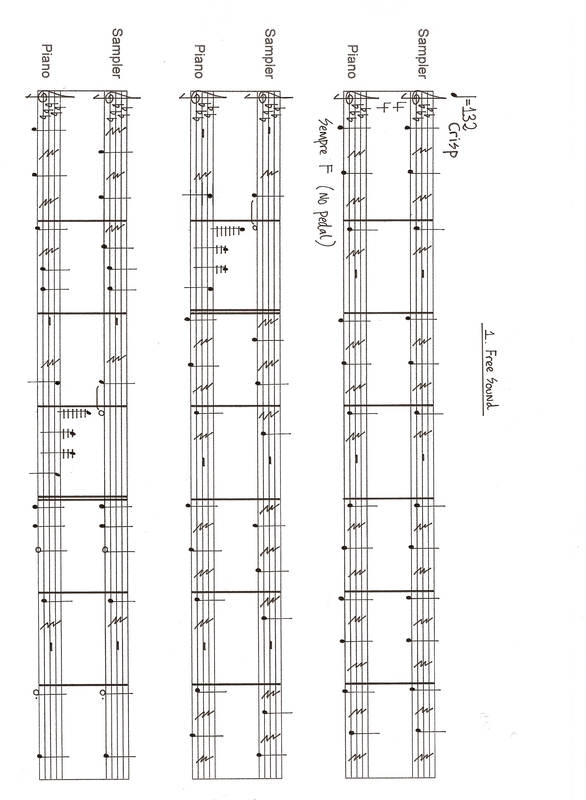 Each sound or action is represented by a letter in the score. In Northern Cities the two performers have to create a bunch of actions and a bunch of sounds, and they can be anything, except that I stipulate certain relationships. For instance, the A, B and C for performer 1 might be three sound events that are connected to each other, but have no relationship with the A, B and C of the other performer. But then D is the opposite, its a physical action, and it should make a connection with the D of the other performer. For instance, D for one performer is to punch, and for the other is to look as they’ve been punched. So I give some concepts for guiding how people should think about how they generate their material but I don’t define the material at all. TR-J: So when you’re starting out on a piece, what is material for you? MS: I guess the first thing to say is that I really in the last few years like material that is related to popular culture and also to the everyday world. So when I’m choosing material that’s sort of where I’m going. But as with the Letter Pieces I’m leaving it open. I guess what connects the pieces where I choose the material with those pieces where I don’t is that the way that I handle the material is usually the same. It’s generally very short objects or events, and a very restricted number of them. So it’s all about patterning and sequencing of them and putting these things in processes and that sort of thing. In a way, what I do with material seems more defining of the language than the material itself. Like in Northern Cities I’ve seen four different performances of that piece, and it really is somehow the same piece each time, because no matter what you put into it the way that it is treated is so specific that it feels the same in a way. TR-J: You’ve found a way of retaining the identity of the piece even though the sound material might be really diverse. MS: That’s right, and in Popular Contexts there are six pieces, and they’re all different, but there is a connection between the first and the fifth, which are basically the same piece, the piano part is almost identical in both of them. The fifth one is called Weird Twin, making a reference to the fact that it’s a recasting of the first one, but the difference is that the samples are all different. So it somehow points at the – not arbitrariness, that’s too strong a word, because not any sample works – but the potential at least that these first choices were not the only ones that could have been made. TR-J: There is this sort of development in your music from things that are more fluid to things that are quite ‘boxed-up’, for want of a better word. The way that the Letter Pieces work seems to lend itself to that kind of on-off kind of binary structure, whereas some of the earlier pieces don’t. Is that a different relationship with performers that has evolved over time as well? MS: That’s the right word. TR-J: And once you’ve established your material, and maybe some aspects of the grid, what sort of decisions are you dealing with as you compose the next bar and the next bar? MS: I suppose the broadest ideas are to create a critical distance from the material. I teach a course for Syracuse University and the students come to London for a 14-week study abroad programme, and I was playing them a few of my pieces on Monday. And one of the students said quite reasonably they didn’t understand why I was starting and stopping the music all the time – they found it really unsettling. And I’m not trying to make unsettled music in any kind of psychological sense, but I do stop and start to try to create some kind of distance from the material. Critical thinking in contemporary music is usually applied to a very select repertoire of sounds and ideas from our postwar tradition, which I find a bit limited and a bit insular. The thinking means a lot to me, but I guess the project is to apply that thinking in a much broader way, to the much more familiar sounds of the everyday world and popular culture. So that’s the background. But to answer the question more specifically, as I said before on Garageband I just get into what I’m doing and just make music that makes me happy, but I always try to step back and think how can I do stuff with this material that you wouldn’t expect of it. The thing is, when you listen to the first few bars of a Country and Western song one of the first things that I might think at least is that I kind of know this musical style and language, and I don’t expect that this song is going to outside it, and you’re normally right. And you could say the same thing about a lot of new music pieces. So I try not to do that. I try and take the material to places beyond where one might expect, outside its frame of reference. That’s a bit of the imagination challenge I set myself. I might start with a bit of calypso music, but then have a look at, try and find something in the material, even taking a bit of a ‘Stockhausen’ analytical attitude, so that I can find something different in it. TR-J: When I listen to some of your pieces it’s as though the music’s happening to the material – it’s the opposite of that organic thing where one grows out of the other, and actually the material’s caught in this structure or bunch of forces that are happening to it, and it doesn’t really have a lot of control over how it proceeds. MS: Yeah, I guess that’s the idea of putting things in sequences, it can often make a distance and make something familiar unfamiliar, which I like. But also you’re right that it is completely inorganic because the material is really fixed – and I don’t just mean the samples, I also mean the instrumental music. I pretty much only do to the instrumental music the kind of thing that I do to the samples. That is, the only variations are to slow it down, speed it up or cut it off in weird places, or to loop it or whatever. So there’s really no organic development in the material. TR-J: One more question, the trademark question: here’s a middle C, what do you do now? MS: Well, I would probably couple it with a sample at the moment, which is a pretty lazy answer, but it’s probably the truth [laughs]. Yeah, that is genuinely what I would do at the moment! MS: I normally have an idea. Like I said, one of the pieces in Popular Contexts is all about telephone sounds. And in another one I tried to make a MIDI orchestra – it’s like klangfarben gone wrong, so every note of the keyboard is a different MIDI instrument, so the pianist and the sampler play the exact same stuff, so in one version you hear the piano playing it all with uniform attacks and timbre, but then you hear the exact same thing translated – it sounds like a complete mess really, and you can kind of really see how different attacks can be. So, I don’t just surf around freesound.org [laughs], I normally have some ideas! Anyone remotely familiar with the new music scene in Great Britain will have encountered James Weeks in one of his many guises – conductor, composer, director, writer, enabler. A cheeky part of me sees him in this way as a sort of pre-Faustian Thomas Adès. He is a brilliant conductor – his vocal group EXAUDI is widely acknowledged as one of the very best in the business – but he is not as well-known for his own music. Which is a shame, because his is one of the most distinct voices of his generation in English composition. Moreover, I think it is a distinctly English voice, although it’s hard to explain why. Not in any crude nationalistic sense, you must understand, but in the same sense that makes ‘frost and snow fall, mingled with hail’ (‘hreosan hrim ond snaw / hagle gemenged’; The Wanderer) one of the most quintessential lines in English literature, or the sense that informs Purcell’s brutally honest passacaglias, the bleakness of the landscape in Britten’s Peter Grimes, and Finnissy’s empirical dissections of the world’s music. It’s a little bit cold, a little bit stand-offish; but, from that, capable of revealing great beauty in things. The Catford Harmony, one of a series of ‘London Harmonies’, is from the gnarlier end of Weeks’ style: its punching rhythms and wide intervals spool out grids of sound, like a demented ticker-tape machine. The music shapes the very air around it. On one level it is quite crude music, but Weeks’ real gift lies in the construction of his canons, which never fall into the trap of sounding well most of the time, but flagging occasionally ‘but we’ll leave it because that’s what the process demands’. The energy, and thus the interrogation of the fundamental materials, never wavers. In a world of ephemera, deceptions and cynical exploitation, music of such honesty and commitment is to be cherished. James Weeks: I honestly couldn’t imagine myself not doing it. I’ve been set on being a composer since I was nine, so clearly there is an overriding inner compulsion within me to write which I don’t question and never have. In the last few years, when my working time has been torn between doing things that earn money (mainly conducting) and writing, there has been a certain heightened urgency to the question of ‘why?’, but all I can say is that I feel lost without regular recourse to the desk: everything gets out of kilter and I get miserable. So I think I am shackled to this ‘anachronistic career choice’ for good! TR-J: How do you think composing, being a composer, is different now than from 20–30 years ago? JW: Well, staying with the idea of composing being anachronistic (in the way I do it, with pencils, manuscript paper, scissors and paste), I think things have changed markedly in the ten years I have been working, let alone 20 or 30. When I was studying at the beginning of the last decade (I did an MA and PhD at Southampton from 2000–05), there still seemed to me to be a basic hegemony in place of notated music, acoustic instruments, composition-as-discourse, a real sense of developing modern/post-modern/experimental traditions. It may be just that my perspective has changed since I am no longer attached to a university, but I think that recently the culture of what you might call Sound Art and extended/multi-media has much more profoundly penetrated new music, both in obvious ways (the ubiquity of electronics) and less obvious ones – there is a major aesthetic shift going on at present and I think the next ten years will be really important ones for the art-form. My impression is that a lot of what is going on in this area is very superficial, often (ironically enough) quite conceptually dated, and driven in large part by promoters who want to look cool; but beneath that there are currents which are altering both the way the composer works, technically speaking, and the idea of composing and composition. It remains to be seen just how anachronistic my rather traditional idea of a composer actually is! Being of an experimental bent, I’m very enthusiastic about the more radical things going on, but sometimes I feel a bit sad that fewer and fewer people are listening to music in the way that they did, because in my view it was more interesting. JW: I conduct or play in a lot of the performances of my music that take place at the moment. I don’t think that’s ideal as it looks like you’re a bit of a one-man-band, but that’s the way it is just now. I’m very happy being in charge of performances because I’ve found that the style of playing or singing I want doesn’t necessarily come naturally to many performers, so it’s good to be on hand to get that right. I find often players are expressive in the wrong way – too Romantic or rather Expressionist in the sort of standard late-20th century repertoire mode – whereas in fact if you wanted a model, Early Music style would be a lot closer (though not quite right either). When other groups or players take up pieces or I’m not on hand to work with them, I just take the attitude that I’m delighted they’re playing it at all and don’t get all Ligeti-ish about it (he was famous for his high-handed way with performers). Sometimes that ends in tears (my own) but I’m learning slowly who ‘gets’ my work and who doesn’t. It’s a process. JW: I’m very materialistic about material. It’s something absolutely concrete, like bricks or mud or water. There are two different things here though: there is the sonic material, the physicality of the sound itself, and then there is the material on the page, the ‘music-stuff’, which gets shaped and played with and permutated. I keep both areas separate and then they get put together in the sounding result: what excites me is the way these two material planes act on each other in performance, often very unpredictably. Some pieces privilege one materiality over the other, the balance is always a bit different, which is one reason why my pieces often sound very different from each other, even when the basic way of working is very similar. JW: For the last few years I have been working with the most basic or elemental of musical materials that I can. Talking of mud and bricks, these really are musical building blocks, very simple or crude. These preferences are hard-wired for me – I feel completely at home with them. My ways of proceeding are similarly basic at the moment, very simple permutations or patternings using the minimum of resources – born of the urge to see what I can get from the most barren of musical ground. As I naturally write linearly, most pieces tend to be contrapuntal layerings of these simply-permutated lines, quite often arranged into blocks which then get replaced by other blocks, and so on. Canon is another central technique for me. So the decisions I am taking are firstly to do with the selection of materials, and secondly to do with the way things are going to be permutated or extended. Most of this takes place at a pre-compositional stage. Timing and placement can also be pre-compositionally decided, though not always. In short, composition literally is ‘putting together’ for me: I write to find out what the consequences of my decisions are when everything is put together. And the decisions themselves are not primarily ones of musical efficacy, but are stringently aesthetic in character. JW: Dozens! So many ideas for pieces – no time to write them. In terms of commissions (or requests), I have a flute piece to write for the autumn for the Japanese flautist Reiko Manabe, and then the next big piece is the climax to my London Harmonies series, The Spitalfields Harmony. This will be for choir (New London Chamber Choir) and ensemble (London Sinfonietta) for next year’s Spitalfields Music Summer Festival. Beyond that I am planning a setting of Pessoa for a handful of voices and instruments for next autumn, and a series of short instrumental pieces with tape. JW: I think a line of minims would be nice. Then I would think of something to put on top of it. Ireland’s Crash Ensemble, founded by Donnacha Dennehy, Andrew Synott and Michael Seaver, has become a hub for an exciting brand of Irish postminimalist and electroacoustic music. Linda Buckley is one composer to have benefited in this way, and Crash are bringing her piece for viola and electronics, Do you remember the planets? to Kings Place as part of the Irish American concert series taking place this week. 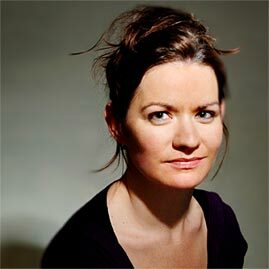 Buckley is completing her PhD at Trinity College, Dublin, with Dennehy, and one senses a connection in her use of microtonal inflections within harmonically open textures, something that gives her music (many excerpts of which can be heard on her website) a combination of bold assertiveness and a smooth, glassy elegance. Planets, for viola and soundtrack and inspired by Pythagoras’s theory of the music of the spheres, is a good example: the viola part is quite sparse, dominated by strident fifths and fourths, but the accompanying soundtrack offers an alternative perspective of diffuse textures and harmonies that completely transform the solo line, opening its solidity and certainty up to question. Buckley has just returned from China, where she spent time working on a new piece combining uilleann pipes, erhu and electronics: the combination of instruments from within and without the Western classical tradition parallels her interest in combining tonal and microtonal harmonic spheres. In the following interview, she talks about her compositional thought and method, her relationship with performers, and how influences from world music feed into her work. Linda Buckley: I guess I don’t really think of composing as a ‘career choice’ as such, in that I don’t think I ever really conciously made the decision ‘I am going to be a composer’ – it just happened quite naturally, it chose me. It was like a natural logical progression stemming from a curiosity about sound, about harmony, about emotion. I do it because something sparks this inside me, and I want to share it – maybe it’s an atmosphere, or a sense of magic. Something that can be expressed in sound, perhaps not so easily in the written word. I do it because when music excites me, or moves me, I want to communicate this to others, share the experience. LB: It’s difficult to say, but I imagine there’s more of an atmosphere of openness and inclusivity in the current scene than perhaps was the case thirty years ago, maybe less reactionary activity. There is a sense of boundaries being blurred now between genres which I think can be a positive thing – e.g. my experience of Irish traditional singing, Indian vocal percussion, Javanese Gamelan, medieval organum as well as electronica and postrock has definitely filtered down into what I do. I compose music, but I also sing, play gamelan, perform electronic improv – it’s all about embracing the total experience of music making. For me, I like the human connection aspect – perhaps moving away from the image of solitary isolated composer figure removed from society! LB: This is very important to me – a lot of this is to do with getting to know each other as people, as well as the musical composer/performer relationship. That’s why I love working closely with performers, developing the piece with them, exchanging ideas, honing the craft. I also like to work with particular performers/ensembles on more than one occassion, building up a dynamic with them. I think this make rehearsal much more interactive and means that more of the original feeling and intention of the piece can be conveyed meaningfully to the audience in performance. I’m always excited to see what happens when a piece is played by different performers. For example, this piece Do you remember the planets? for viola and tape is probably one of my most performed – from Tasmania to Dublin to New York and beyond! Every time I hear it played by a different violist. I hear something new in it – it really keeps it alive and fresh for me, as it written five years ago which feels like a long time ago now. Some players really go for its almost raw electronica-like energy, others connect more to its medieval influence, and purity. LB: This can come from anything – from the sound of a gate creaking, to wind blowing through pipes, or a single chord that seems to extend out, like a blurred vision. Sometimes it’s like having ‘aural hallucinations’ when you can internally ‘hear’ the sound you wish to create, in the early stage of the process. Then you try to capture that initial experience – to ‘sonify’ it. That’s all part of the excitement, moving closer and closer to capturing that aural idea … sometimes it’s almost like trying to remember a dream. But in a more practical sense, eg. when working with instruments, it could be something like the sound of a single note played ‘sul tasto’ on cello – this can then trigger more ideas. Or in electronics it could be a type of granulation – perhaps extending a short simple sound into something more harmonic and expansive. LB: I suppose major interests for me would be thinking in terms of parameters to explore such as timbre, rate of change, harmony etc. When dealing with pitched material, how the horizontal relates to the vertical and vice versa. LB: I’m writing up my doctoral thesis at the moment so that keeps me busy! I’ve also just returned from China where I worked with traditional instrumentalists on a new piece – exploring ways of combining Irish traditional instruments with Chinese instruments, and electronics … so that will have further developments in the future. I’ll also be working on a new piece for the Irish National Symphony Orchestra, so I’m excited to immerse myself in the large forces and possibilities of the orchestral sound world. Future work includes new choral music, as well as more performing with live electronics. LB: Extend it out, into a sea of lush microtones …!